The anabolic effects of β2-adrenoceptor (β2-AR) agonists on skeletal muscle have been demonstrated in various species. However, the clinical use of β2-AR agonists for skeletal muscle wasting conditions has been limited by their undesired cardiovascular effects. Here, we describe the preclinical pharmacological profile of a novel 5-hydroxybenzothiazolone (5-HOB) derived β2-AR agonist in comparison with formoterol as a representative β2-AR agonist that have been well characterized. In vitro, 5-HOB has nanomolar affinity for the human β2-AR and selectivity over the β1-AR and β3-AR. 5-HOB also shows potent agonistic activity at the β2-AR in primary skeletal muscle myotubes and induces hypertrophy of skeletal muscle myotubes. Compared with formoterol, 5-HOB demonstrates comparable full-agonist activity on cAMP production in skeletal muscle cells and skeletal muscle tissue–derived membranes. In contrast, a greatly reduced intrinsic activity was determined in cardiomyocytes and cell membranes prepared from the rat heart. In addition, 5-HOB shows weak effects on chronotropy, inotropy, and vascular relaxation compared with formoterol. 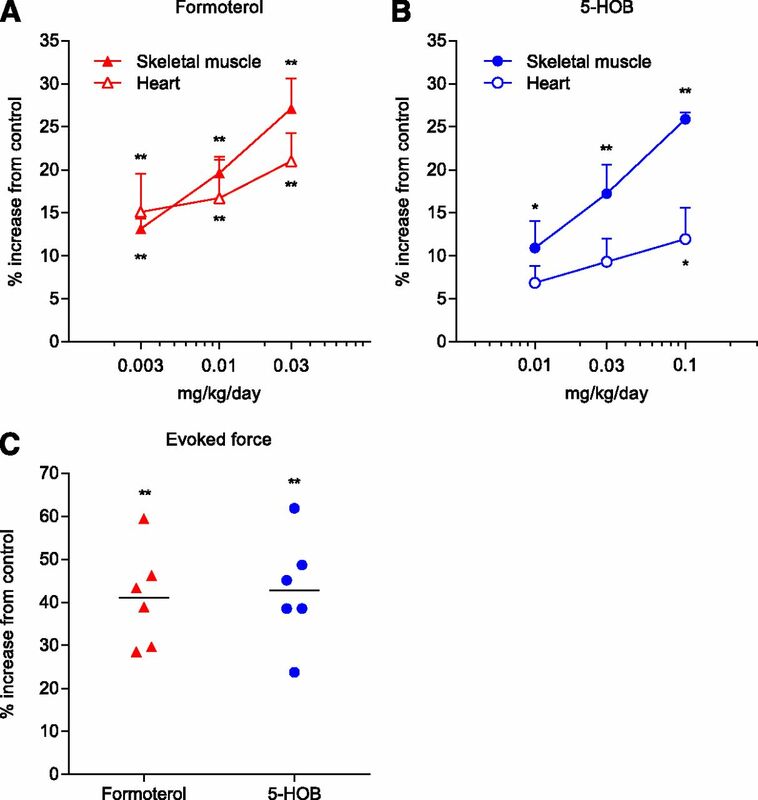 In vivo, 5-HOB significantly increases hind limb muscle weight in rats with attenuated effects on heart weight and ejection fraction, unlike formoterol. Furthermore, changes in cardiovascular parameters after bolus subcutaneous treatment in rats and rhesus monkeys are significantly lower with 5-HOB compared with formoterol. In conclusion, the pharmacological profile of 5-HOB indicates superior tissue selectivity compared with the conventional β2-AR agonist formoterol in preclinical studies and supports the notion that such tissue-selective agonists should be investigated for the safe treatment of muscle-wasting conditions without cardiovascular limiting effects. Skeletal muscle atrophy is a common debilitating comorbidity currently without any approved treatment options. In humans, skeletal muscle atrophy occurs under various physiologic and disease conditions, such as: following an injury resulting in immobilization, critical illness, burns, cancer, congestive heart failure, liver disease, chronic obstructive pulmonary disease, chronic kidney disease, acquired immune deficiency syndrome, and diabetes. The reduction in strength and endurance associated with the involuntary loss of muscle mass results in functional limitations, loss of independence, a reduced quality of life, increased disability, and increased mortality (Dudgeon et al., 2006; Lynch et al., 2007; Thomas, 2007). β-Adrenoceptors (ARs) are a subfamily of G protein-coupled receptors that are activated by the endogenous catecholamines, adrenaline and noradrenaline. They regulate diverse physiologic functions, from heart pacemaker activity, myocardial contractility, and vascular and bronchial smooth muscle tone, to glucose and lipid metabolism (Zheng et al., 2005). β-ARs can be classified into three distinct subtypes, β1, β2, and β3, which share 65%–70% homology between these subgroups. β1-ARs are the main subtype in the heart whereas β2-ARs are prominently found in smooth and skeletal muscles and β3-Ars, in white and brown adipose tissues, gallbladder, and urinary bladder (Kim et al., 1991; Sarsero and Molenaar, 1995; Ursino et al., 2009). Synthetic β2-AR agonists were initially developed to facilitate bronchodilation to relieve asthma and chronic obstructive pulmonary disease (Solis-Cohen, 1990). However, several studies have shown the efficacy of β2-AR agonists in addressing skeletal muscle wasting conditions in animal models such as cancer cachexia and sarcopenia (Busquets et al., 2004; Ryall et al., 2007) and also in human clinical trials in orthopedic patients, cancer cachexia, and muscular dystrophy patients (Martineau et al., 1992; Maltin et al., 1993; Kissel et al., 2001; Fowler et al., 2004; Skura et al., 2008; Greig et al., 2014). In animals, β2-AR agonists can prevent skeletal muscle atrophy (e.g., injury) and elicit hypertrophy, which is associated with improvements in strength in both fast- and slow-twitch muscles (Ryall et al., 2006, 2008; Burniston et al., 2007). The increase in muscle mass results from an increase in protein synthesis and a decrease in protein degradation, mediated via β2-AR coupling to Gαs followed by adenylate cyclase induction, and a consequent increase in intracellular cAMP concentration. In addition, the Gβγ subunits are thought to activate the PI3K-Akt pathway (Lynch and Ryall, 2008; Ryall et al., 2010). Besides the induction of skeletal muscle hypertrophy and the inhibition of atrophy, β-AR stimulation also serves as a powerful way to increase cardiac output in response to stress or exercise. As a consequence, the clinical use of β2-AR agonists has been limited by their cardiovascular effects, for example, tachycardia and palpitation (Inamizu et al., 1984; Löfdahl and Svedmyr, 1989). Moreover, sustained β-AR stimulation can promote pathologic cardiac remodeling such as cardiomyocyte hypertrophy and apoptosis, and ultimately contribute to heart failure. As shown in studies using heart-specific overexpression of β1-AR- and β-AR subtype–knockout animal models, β1-AR plays a predominant role in regulation of contractility and pathologic remodeling effects (Rohrer et al., 1996; Chruscinski et al., 1999; Engelhardt et al., 1999), β-AR-induced positive contractile responses in human heart are also predominantly mediated by β1-AR stimulation, but β2-AR causes a significant positive chronotropic and inotropic effect (Levine and Leenen, 1989; Brodde, 1991). Here, we describe the preclinical pharmacological profile of a novel 5-hydroxybenzothiazolone (5-HOB) β2-AR agonist, (R)-7-(2-(1-(4-butoxyphenyl)-2-methylpropan-2-ylamino)-1-hydroxyethyl)-5-hydroxybenzo[d]thiazol-2(3H)-one, which is both β-AR subtype and tissue selective. Our data demonstrate that 5-HOB has strong anabolic and functional skeletal muscle effects at doses associated with reduced cardiovascular effects in animal models, indicating a substantially improved safety margin compared with the β2-AR agonist formoterol when administered systemically. To understand the unique efficacy profile of 5-HOB, a series of in vitro studies was carried out, including binding affinity measurements and β2-AR kinetics, receptor selectivity and cellular activity, as well as functional studies with isolated organs, and in vivo studies. (R)-7-(2-(1-(4-butoxyphenyl)-2-methylpropan-2-ylamino)-1-hydroxyethyl)-5-hydroxybenzo[d]thiazol-2(3H)-one (5-HOB; Fig. 1A) was synthesized at Novartis Pharma AG (Basel, Switzerland) according to the synthetic method described in WO 2014132205. Formoterol hemifumarate was purchased from Tocris Bioscience (cat. no. 1448; Bristol, UK) and AK Scientific (cat. no. 67361; Mountain View, CA). Doses of formoterol are quoted as the nonsalt (molecular weight ratio = 1.169). 2-Hydroxypropyl β-cyclodextrin was purchased from Sigma-Aldrich (cat. no. 332593; St. Louis, MO). (A) Chemical structure of 5-HOB: (R)-7-(2-(1-(4-butoxyphenyl)-2-methylpropan-2-ylamino)-1-hydroxyethyl)-5-hydroxybenzo[d]thiazol-2(3H)-one. (B) Effect of formoterol and 5-HOB on cAMP production in membranes isolated from Wistar rat gastrocnemius muscle and from the heart. Percentages of cAMP response were determined relative to the Emax of formoterol in skeletal muscle membranes. Data shown are means ± S.E.M. of three independent experiments. *P < 0.05; **P < 0.01 on efficacy of 5-HOB vs.. formoterol in heart membranes and #P < 0.05; ##P < 0.01 in skeletal muscle membrane (T-test, unpaired). Chinese hamster ovary (CHO) cells stably expressing recombinant human β1- and β2-AR with matched expression levels were made in-house and maintained as described before (Battram et al., 2006). Human embryonic kidney 293 (HEK293) cells expressing human β3-AR were maintained at Eurofins Panlabs Taiwan Ltd. according to standard conditions. β3-AR expression levels in HEK293 were comparable to the β1-AR and β2-AR receptors levels in the CHO cells (Bmax values 0.55, 0.334, 0.356 pmol/mg protein, respectively). Human primary fetal skeletal muscle cells (skMC, cat. no. CC-2561 female; Lonza, Basel, Switzerland) were maintained and differentiated for 5 days as described previously (Lach-Trifilieff et al., 2014). To enhance differentiation the medium was supplemented with 1 μM SB431542 (Sigma-Aldrich). Primary myoblasts were isolated from the quadriceps of Wistar Han rats at the age of 2–3 days, mixed gender (neonatal); from the gastrocnemius of adult male beagle dogs; and from the gastrocnemius of adult female rhesus monkeys. Briefly, for digestion, muscle pieces were incubated in a dissociation medium [Dulbecco’s modified Eagle’s medium (DMEM)/F12; 6 mM NaHCO3; 1× insulin-transferrin-selenium (ITSX); 1% phosphatidylserine (PS)] containing collagenase IA (600 IU/ml; Sigma-Aldrich) and hyaluronidase I-S (600 IU/ml; Sigma-Aldrich) for 10 minutes at 37°C. Supernatants were discarded and tissue pieces were incubated and agitated in the dissociation medium containing dispase II (2.5 mg/ml; Roche, Mannheim, Germany) for a further 15 minutes at 37°C. The supernatant was collected and strained through a 100 μm mesh filter into ice-cold stop medium (DMEM/F12; 10% FBS; 1% ITSX; 1% PS), centrifuged at 130g at 4°C for 5 minutes. Pellets containing cells were resuspended in the same medium and preplated to separate fibroblasts from muscle cells. After 1 hour the supernatant containing muscle cells was collected and centrifuged at 130g at 4°C for 5 minutes. Cells were resuspended in the stop medium and plated in 384-well plates coated with Matrigel (Falcon, Bedford, MA) or collagen (Sigma-Aldrich). On the following day this medium was exchanged for one containing reduced serum content [4% fetal bovine serum (FBS)], and two days later cells were transferred to a differentiation medium (DMEM/F12; 2% HS; 1% ITSX; 1% PS) for 5 days. Human iPS-derived cardiomyocytes (cat. no. CMC-100-110-001, female; Fujifilm Cellular Dynamics, Inc., Madison, WI) were plated on fibronectin (Sigma-Aldrich) and maintained according to the supplier’s protocol. Primary neonatal rat ventricular cardiomyocytes were prepared from 2- to 3-day-old pups of Wistar Han rats. Briefly, hearts were quickly excised, the atria were cut off, then the ventricles were minced and digested at 4°C overnight in calcium-free HEPES-buffered Hanks’ solution, pH 7.4, plus trypsin (100 IU in 10 ml). Soybean Trypsin Inhibitor [2 mg/ml in Hanks’ balanced salt solution (HBSS); Worthington, Lakewood] was added and further digestion was performed at 37°C for 45 minutes by collagenase II (300 IU/ml in HBSS; Worthington). The isolated cells were centrifuged at 80g, room temperature for 5 minutes. The cell pellet was resuspended in preplating medium containing DMEM/F12, 4.5 mM NaHCO3, 1× Primocin, 5% fetal calf serum (FCS), and 5% HS and preplated for 1 hour to reduce the contribution of nonmyocardial cells. For the cAMP assay, cardiomyocytes from the supernatant were transferred into 384-well plates coated with collagen in medium containing DMEM/F12; 4.5 mM NaHCO3; 1× Primocin; 2% FCS; 2% HS; 1% ITSX; 10 μM BrdU. After 24 hours cells were transferred to a starvation medium without FCS and HS, and the cAMP assay was performed on the following day. CHO cells expressing the human β2-AR were used for cell membrane preparation for radioligand binding studies. Cell membranes were prepared and competition binding assays were performed as described previously (Sykes and Charlton, 2012). To obtain affinity estimates for unlabeled 5-HOB, [3H]-DHA competition binding experiments were performed. [3H]-DHA (Perkin Elmer, Waltham, MA) was used at a concentration of approx. 0.6 nM such that the calculated total binding never exceeded more than 10% of total ligand concentration added, therefore avoiding ligand depletion. [3H]-DHA was incubated in the presence of the indicated concentration of unlabeled 5-HOB and CHO-cell membranes expressing the β2-AR at 37°C in assay binding buffer in 96-deep well plates with gentle agitation for 2.5 hours to ensure equilibrium was reached. The kinetic parameters of unlabeled 5-HOB were assessed using the methodology of Sykes et al. 2010. All experiments were analyzed by nonlinear regression using GraphPad Prism 5.0 (GraphPad Software, La Jolla, CA). Competition displacement binding data were fitted to sigmoidal (variable slope) curves using a four parameter logistic equation. IC50 values obtained from the inhibition curves were converted to Ki values using the method of Cheng and Prusoff (1973). [3H]-DHA association data were fitted as follows to a global fitting model using GraphPad Prism 5.0 to simultaneously calculate kon and koff. Association and dissociation rates for unlabeled antagonists were calculated using the equations described by Motulsky and Mahan (1984). The percentage occupancy was calculated by estimating the concentration of each compound producing a cAMP response equivalent to 40% of the isoprenaline control in the cAMP assay [percentage of control (EC40), i.e., identical system response levels]. kobs curves were then simulated using the kinetic parameters koff and kon at the concentration of compound producing a response equivalent to the percentage of control [EC40]. From this type of analysis it was possible to estimate the percentage of receptors occupied by each agonist (Sykes and Charlton, 2012). Increases in cAMP levels were determined using HTRF technology (cAMP dynamic 2 bulk HTRF-Assay; Cisbio, Codolet, France) in 384-well plate format according to the manufacturer’s protocol. Cells were stimulated with β2-agonists for 30 minutes in presence of 3-isobutyl-1-methylxanthine (Sigma-Aldrich) and then lysed by using Cisbio reagents. The measurement was performed with the Molecular Devices SpectraMax Paradigm (Molecular Devices LLC, Sunnyvale, CA). Results were calculated from the 665/620 nm ratio, and data were expressed in percentage of the DMSO-stimulated control. The functional β3-AR assay was performed at Eurofins Panlabs Taiwan Ltd.
Human skMC were differentiated to myotubes in 12-well pates coated with Matrigel and stimulated with compounds for 48 hours. Immunostaining with anti-myosin heavy chain antibody (cat. no. 05-833; Upstate Biotechnology, Lake Placid, NY) was performed and myotube diameters were determined as described previously (Trendelenburg AU et al., 2009). Images shown were taken with Cellomics CellInsight HCS Reader with 10× objective (ThermoFisher Scientific, Paisley, France). Male Wistar Han or Sprague Dawley rats were purchased from Charles River Laboratories (Sulzfeld, Germany or USA), acclimatized to the facility for 7 days, housed in groups of two to three animals at 25°C with a 12:12-hour light-dark cycle, and fed a standard laboratory diet. Food and water were provided ad libitum. Female rhesus monkeys were housed in a colony at Novartis Pharma AG. Besides following the Guide for the Care and Use of Laboratory Animals, the experiments described here were performed according to the regulations effective in the Canton of Basel-City, Switzerland, as well as East Hanover (NJ) and Cambridge (MA). Procedures for the preparation of cell membrane fragments for assessment of β-AR activity have been described previously (MacEwan et al., 1996; Beitzel et al., 2007). The gastrocnemius muscle and the heart were collected from 3- to 4-month-old male Wistar rats. The frozen tissues were pulverized in a Cryopress (Microtec Co., Ltd, Chiba, Japan) and homogenized in a buffer containing 20 mM HEPES, 0.25 M sucrose, 1 mM EGTA pH 7.0, and a protease inhibitor cocktail (Roche Diagnostics, Rotkreuz, Switzerland). The homogenate was centrifuged at 1000g for 10 minutes, and the supernatants were filtered through a polyamide mesh (pore size 250 μm) into an ultracentrifuge tube. The filtered supernatants were further cleared by centrifugation at 10,000g for 15 minutes, and the supernatant containing cell membrane fragments was prepared by repeated ultracentrifugation at 100,000g for 30 minutes to isolate the sarcolemma membrane. Enrichment in membrane fraction was validated by WB (Supplemental Fig. 1). After this step, the cell membrane pellets were resuspended in a buffer containing 10 mM HEPES, 0.1 mM EDTA pH 7.4, and a protease inhibitor cocktail. The cell membrane suspensions and compounds (diluted in a buffer containing 30 mM HEPES pH 7.4, 20 mM phosphocreatine, 20 IU/ml creatine phosphokinase, 20 μM GTP, 400 μM ATP, 10 mM MgCl2, 300 μM IBMX, 200 μM Rolipram) were mixed with a ratio of 1:1 and incubated at room temperature for 30 minutes. Sequentially, HTRF cAMP CisBio reagents were added, followed by measurement and analysis (performed as described above). Chronotropy in rabbit sinoatrial node: The right atrium was separated from the rest of the heart (collected from New Zealand white female rabbits from Charles River Laboratories). The preparations were mounted in a tissue bath and kept at 37°C for at least 1 hour of stabilization. The stabilization phase lasted at least 60 minutes during the period that the sinoatrial (SA) pacemaker activity remained stable for at least 20 minutes. Action potentials were intracellularly recorded with a standard glass microelectrode filled with 3 M KCl, connected to a high-input impedance-neutralizing microelectrode amplifier VF-180 (Bio-Logic Science Instruments, Seyssinet-Pariset, France). The action potentials were displayed on a digital oscilloscope HM-407 [Rohde & Schwarz (HAMEG Instruments), Munich, Germany], analyzed by means of high-resolution data acquisition system Notocord-hem software 4.2 (Notocord Systems, Le Pecq, France). Inotropy assay in guinea pig left atria: The assay was conducted at Eurofins Panlabs (Taipei, Taiwan). Left atria were isolated from Dunkin Hartley–derived male or female guinea pigs with body weights of 600 g, and the inotropy response as measured by isometric changes in grams was evaluated according to the method described elsewhere (Grodzińska and Gryglewski, 1971). Vascular relaxation in rat aortic ring: The thoracic aortas were isolated from Sprague Dawley rats, and cut into rings 2- to 3-mm long. The rings were mounted on stainless steel hooks and suspended in organ glass chambers (Radnoti, Covina, CA). Tension development was measured by isometric force transducers 159901A (Radnoti) connected to a data acquisition system, PowerLab (ADInstruments, Oxford, UK). Cumulative dose-response curves to formoterol and 5-HOB were obtained. Absolute tension of all points was analyzed, and the relaxant response to each concentration of compound was expressed as the percentage decrease from precontraction induced by 100 nM phenylephrine. Formoterol and 5-HOB were subcutaneously administered to rats using Alzet osmotic minipumps (the model 2ML4 with pumping rate of 2.5 μl/h; Charles River Laboratories) for 4 weeks. Formoterol was dissolved in 0.9% NaCl to achieve doses at 0.003, 0.01, and 0.03 mg/kg per day, and 5-HOB was dissolved in 20% Cremophor EL and ethanol mixed with a ratio of 1:2 in 0.9% NaCl to achieve doses at 0.01, 0.03, and 0.1 mg/kg per day The dose range was selected to achieve a range of plasma compound concentrations like that at steady state. After treatment with the compounds for 4 weeks, the sciatic nerve was attached to a nerve-stimulating electrode (Harvard Apparatus, Holliston, MA) and the Achilles tendon with a piece of calcaneus was attached with a polyethylene thread (Spiderwire 16/1135590; 0.30 mm/110 m; Pure Fishing, Hattersheim Germany) to a force displacement transducer (Model FT10; Grass Technologies, West Warwick, RI) under anesthesia. The knee and ankle joints were immobilized with a clamp, and the stimulating electrode was connected to an electrical stimulator (ADInstruments). The force of contraction was acquired with PowerLab system and analyzed using LabChartPro (ADInstruments). The tibialis anterior, gastrocnemius, and soleus muscles were dissected and weighed. The brain weight was also measured for normalization of heart weights (Sellers et al., 2007). Body weight was expressed as percentage change from day 0 as the start of treatment (initial body weight). Muscle weight was normalized to initial body weight and then expressed as percentage change from the vehicle control group. The organ weight was normalized to brain weight and then expressed as percentage change from the control group. Formoterol and 5-HOB were administered subcutaneously to rats once daily for 4 weeks and then the treatment was discontinued for 5 weeks. Formoterol was dissolved in 0.9% NaCl, and 5-HOB was dissolved in 50% PEG200 in distilled water. Magnetic Resonance Imaging Measurement and Data Analysis. Magnetic resonance imaging (MRI) measurement was performed in the rats under anesthesia with isoflurane at a concentration of 1%–1.3%, using a Bruker Avance 7 T/30-cm wide-bore instrument (Bruker BioSpin, Billerica, MA) equipped with a 12-cm inner diameter (i.d.) actively shielded gradient insert. Two electrocardiography (EKG) electrodes 3M Red Dots (3M; St. Paul, MN) were attached. Respiration, body temperature, and EKG were monitored throughout the experiment using the physiology monitoring system by SA Instruments, Inc. Cardiac images were acquired in the standard cardiac views which are aligned along the principle axes of the organ. The segmentation and length measurements were performed for both diastole and systole. Left-ventricular volume was calculated by integrating the blood pool volume using a truncated cone model, and ejection fraction was also calculated. Muscle volume was measured using an imaging method that separated water and fat signals (Tsao and Jiang, 2013). The three-dimensional water-only image was reconstructed in Matlab (Mathworks). Lower leg muscle volume was calculated using in-house generated software. Rats were surgically instrumented with a chronically indwelling femoral arterial catheter to allow direct measurement of arterial blood pressure and repeated blood sampling, and with a catheter terminating subcutaneously to allow subcutaneous administration of vehicle or compounds. A femoral artery was isolated and a catheter inserted. The catheter was tunneled subcutaneously and exteriorized in the mid-dorsal abdominal region. The catheter exited through a subcutaneously anchored skin button/tether/swivel system that allowed the animal to move unrestrained in a specialized Plexiglas wire-bottom cage. For implanting the subcutaneous catheter, a narrow tunnel was created by inserting a Teflon catheter/needle subcutaneously from the skin button incision site to the midscapular region. The tip of the catheter/needle was pushed through the midscapular skin and the needle removed, leaving the Teflon catheter intact and still protruding through the skin. The hub of the Teflon catheter was cut off. The Tygon subcutaneous catheter was inserted into the Teflon catheter so that the tip of the s.c. catheter extended slightly beyond the tip of the Teflon catheter. The Tygon catheter and tubing were clamped at the exit site from the skin. The Tygon catheter was anchored at the skin button incision site. The Tygon and Teflon tubings were unclamped and the Teflon catheter was removed through the skin puncture wound. The midscapular skin was then lifted to retract the tip of the Tygon catheter subcutaneously. The Tygon catheter was exteriorized through the spring tether along with the arterial catheter. Compound Administration and Data Acquisition. Formoterol was dissolved in 0.9% NaCl, and 5-HOB was dissolved in 0.27% 2-hydroxypropyl β-cyclodextrin in saline. The compound or vehicle was administered subcutaneously via the implanted catheter over 40–45 seconds followed by an air flush over 10–15 seconds. The arterial catheter was attached to a precalibrated blood pressure transducer, Statham P23 (AMETEK Power Instruments, Rochester, NY) for continuous monitoring of arterial pressure. The pulsatile blood pressure signals were conditioned and amplified with Gould preamplifiers and further processed with a Modular Instruments, Inc. digital data acquisition system. For an individual rat, mean arterial pressure and heart rate were continuously derived from all beats over consecutive 15-second intervals. Formoterol and 5-HOB were administered subcutaneously to rhesus monkeys at the age of 6–8 years old with a body weight around 5–7 kg. Formoterol was dissolved in 0.9% NaCl, and 5-HOB was dissolved in 2.5% Pluronic F-127 in 0.9% NaCl. The monkeys were restrained on a chair up to 4 hours after subcutaneous administration and then returned to their pens. Heart rate, potassium, and glucose were measured. Heart rate was measured by a Surgivet V3304 device (Smiths Medical, Adliswil, Switzerland). Blood samples were collected at 0, 0.08, 0.25, 0.5, 1, 2, and 4 hours on the chair, and blood glucose was measured with a glucometer (Accu-Check Aviva Nano; Roche Diagnostics). Potassium concentration was measured by an automated blood biochemistry analyzer (NOVA CRT8A; Laboratory Systeme Flükiger, Menziken, Switzerland). In some experiments, compound concentrations in plasma were measured to assess the relationship between concentration and response. Plasma protein was precipitated by mixing with acetonitrile and removed by centrifugation. The remaining solvent in the supernatant was evaporated, dissolved, and injected into a liquid chromatography–tandem mass spectrometry system, AB SCIEX QTRAP 5500 (AB Sciex, Baden, Switzerland), for analysis. Statistical analysis was carried out using GraphPad Prism; comparison of two groups with unpaired t test, multiple comparisons with Bonferroni’s test or Dunnett’s test following one-way analysis of variance (ANOVA), or Holm-Sidak test or Sidak test following two-way ANOVA as indicated in each figure or table legend. Differences were considered to be significant when the probability value was <0.05. Concentration-response data were evaluated by sigmoid curve fitting using XLfit (IDBS) yielding EC50 values (concentrations causing half-maximal effects) and Emax (maximal effects). Binding Affinity and Kinetic Characteristics. The affinity of 5-HOB and formoterol for the β2-AR was assessed in a [3H]-DHA radioligand competition binding assay using membranes derived from CHO cells expressing the human β2-AR (Table 1). Both agonists showed high binding affinity for the β2-AR in the nanomolar range, with 5-HOB exhibiting an approximately 10-fold higher binding affinity than formoterol (Table 1). We also measured binding kinetic parameters of both agonists using the competition-association binding method first described by Motulsky and Mahan (1984). 5-HOB showed a longer residence time at the human β2-AR, with a slower dissociation half-life compared with formoterol. The mean kinetic kon and koff values determined for 5-HOB were 7.43 × 108 M−1 min−1 and 0.733 minutes−1, respectively, producing a kinetically derived dissociation constant Kd (koff/kon) value of 1.08 ± 0.14 nM, which is in excellent agreement with the equilibrium Ki value obtained from competition binding experiments. Displacement of [3H]-DHA from the β2-AR by β2 agonists was determined in the presence of 1 mM GTP to uncouple the receptor from downstream G proteins; therefore, these affinity measurements are reflective of a low-affinity form of the receptor (Kent et al., 1980). 5-HOB had higher binding affinity to the low-affinity form of the receptor compared with formoterol. The values are expressed as mean ± S.E.M. of at least three independent experiments. In Vitro Functional Activity of 5-HOB in Cellular Systems and Membrane Extracts. The functional activity and receptor selectivity of 5-HOB were evaluated by the measurement of cAMP production in CHO or HEK293 cells stably expressing a comparable level of each of the three human β-AR subtypes: β1, β2, and β3 (Table 2). 5-HOB showed a potent agonistic response at the human β2-AR (EC50 = 3.5 nM) and high selectivity over the other subtypes, β1-AR and β3-AR (EC50 = 793 and 925 nM, respectively). In comparison with formoterol, 5-HOB showed a similar selectivity profile on all three human β-AR subtypes but with an overall 10-fold lower potency. Importantly, a clear difference in the maximum effect (Emax) was observed between the two agonists on the human β1-AR, 40% ± 6.8% for 5-HOB compared with 84% ± 6.5% for formoterol (P < 0.0001 by t test), which is considered to be advantageous for 5-HOB in terms of cardiac safety, as the β1-AR is the main subtype expressed in the heart. β1-AR and β2-AR were expressed in CHO cells; β3-AR was expressed in HEK293 cells. Emax values were determined relative to isoprenaline, a reference nonselective β-AR agonist. The values are expressed as mean ± S.E.M. of two to four independent experiments. On the basis of the above β2-AR functional activity and binding data we performed a modeling simulation of receptor occupancy at the EC40 of cAMP response. The simulation revealed that 5-HOB requires a much higher degree of β2-AR receptor occupancy (70.4%), relative to formoterol (1.8%), to produce an equivalent effect (Table 2), indicating a lower intrinsic efficacy of 5-HOB. In addition, functional cAMP assays were conducted using the relevant primary human, rat, dog, and monkey cells with endogenous expression of β1- and β2-ARs. 5-HOB was shown to be highly potent and efficacious at inducing cAMP production in skeletal muscle myotubes, in a manner similar to formoterol (Table 3). However, 5-HOB was less efficacious (appearing as a partial agonist) than formoterol at inducing cAMP production in iPS-derived human cardiomyocytes and rat cardiomyocytes compared with the effect on skeletal muscle myotubes. The EC50 values were comparable among species, indicating that cross-species differences seem to be minimal in terms of cAMP responses in these cell types. Emax values were determined relative to formoterol, where formoterol was defined as 100%. The values are expressed as mean ± S.E.M. of at least four independent experiments, each performed with seven concentrations of compounds (10-fold dilutions) in triplicates. The induction of cAMP was also evaluated in cell membranes isolated from rat skeletal muscle and heart tissue (Fig. 1B; Table 4). The effect of 5-HOB on cAMP induction was quite prominent in rat skeletal muscle membranes but much weaker in rat heart membranes. Compared with formoterol, 5-HOB demonstrated comparable maximal efficacy on skeletal muscle membranes and a significantly reduced efficacy on heart membranes (P = 0.005 by t test), clearly demonstrating the tissue selective characteristics of 5-HOB. In conclusion, all in vitro functional studies point to a potent effect of 5-HOB on skeletal muscle comparable to that of formoterol, and an intrinsically weaker effect of 5-HOB on the cardiac tissue (membranes or cells) including in comparison with formoterol. % cAMP responses was determined relative to the Emax of formoterol in skeletal muscle membranes. The EC50 and Emax values ± S.E.M. of experiments from three independent membrane preparations, each performed with seven concentrations of compounds (10-fold dilutions) in triplicates. In Vitro Effect on Skeletal Muscle Hypertrophy. The functional activity of 5-HOB was additionally tested in an in vitro human primary skeletal muscle hypertrophy assay (Fig. 2). 5-HOB induced a significant increase in skeletal myotube diameter, an effect that was blocked by the β2-AR antagonist ICI-118,551 but not by the selective β1-AR antagonist CGP20712. These data indicate that skeletal muscle hypertrophy is specifically induced by agonistic activity of 5-HOB on the β2-AR. Hypertrophy in human primary skeletal muscle myotubes. (A) Differentiated myotubes treated with DMSO control, formoterol (1 μM), or 5-HOB (1 μM) for 48 hours were stained with anti–myosin heavy chain (MyHC). Shown are representative pictures. (B) In vitro differentiated human skeletal muscle myotubes were treated with 5-HOB (1 μM) in the absence or presence of a β1-antagonist (CGP20712A, 1 μM) or a β2-antagonist (ICI-118’551, 1 μM) for 48 hours, and changes in myotube diameters were measured. Data are expressed as percentage increase compared with the DMSO control treatment (as 100%). The values are expressed as mean ± S.E.M. of three independent experiments. **P < 0.01; ***P < 0.001 increase vs. DMSO control (one-way ANOVA, followed by Bonferroni’s test). In Vitro Functional Activity of 5-HOB in Isolated Organs. To assess tissue selectivity, the effects of 5-HOB on the cardiovascular system have been evaluated in in vitro isolated-organ assays: rabbit sinoatrial node for measuring chronotropic effects (Fig. 3), guinea pig left atria for measuring inotropic effects (Table 5), and rat aortic ring for measuring vascular relaxation effects (Table 5). Formoterol was shown to be a potent inducer of sinoatrial node pacemaker activity (Fig. 3B; +11% at 5 nM and +45% at 150 nM), whereas 5-HOB showed a weak effect on chronotropy up to a concentration of 150 nM (Fig. 3C; +6.5% from baseline). No direct effects of 5-HOB were noted on inotropy at concentrations of up to 10 μM, while formoterol induced atrial contractility with an EC50 of 17 nM. In an aortic ring relaxation assay, formoterol showed a potent effect with an EC50 of 0.8 nM, but 5-HOB showed a weaker effect with an EC50 of 31 nM. Overall, the effect of 5-HOB on chronotropy, inotropy, and vascular relaxation were observed only at the highest concentrations and were negligible in the concentration range producing skeletal muscle changes described below. Effects of formoterol and 5-HOB on the beating rate of rabbit sinoatrial node. (A) values are means ± S.E.M. (n = 5 to 6) and % changes from baseline values. (B) Superimposed SA action potentials exposed to formoterol (mean of n = 5). (C) Superimposed SA action potential exposed to 5-HOB (mean of n = 6). Left atrium was isolated from Dunkin Hartley guinea pigs and aortic ring was isolated from Sprague Dawley rats. The values are expressed as means of n = 2 for left atrium and n = 7 for aortic ring. In Vivo 5-HOB Effects on Skeletal Muscle and on Heart in Wistar Rats. The effect of 5-HOB on skeletal muscle and heart weight was evaluated in Wistar rats with subcutaneously implanted osmotic minipumps, in comparison with the effect of formoterol. Formoterol significantly increased both skeletal muscle and heart weight to a similar extent: 13% and 15% at 0.003 mg/kg (both P < 0.05), 20% and 17% at 0.01 mg/kg (both P < 0.05), and 27% and 21% at 0.03 mg/kg (both P < 0.05), for the weight of pooled hind limb skeletal muscle and heart in comparison with the vehicle control, respectively (Fig. 4A; Supplemental Table 1). The delta in weight changes between skeletal muscle and heart were not statistically significant at all doses for formoterol (P > 0.05, Supplemental Table 1). In contrast, 5-HOB showed an increase selective for skeletal muscle weight over heart weight: 11% and 6.9% at 0.01 mg/kg (P < 0.05, P = 0.2324), 17% and 9.3% at 0.03 mg/kg (P < 0.05, P = 0.0939), and 26% and 12% at 0.1 mg/kg (both P < 0.05), for the weight of pooled hind limb skeletal muscle and heart in comparison with the vehicle control, respectively (Fig. 4B; Supplemental Table 1). It should be noted that the weight changes in the heart at the two lower doses were not statistically significant from the vehicle control (Fig. 4B). The delta in weight changes between skeletal muscle and heart were not statistically different at lower doses and became statistically significant at 0.1 mg/kg (Supplemental Table 1). A significant increase in evoked force was also observed in parallel to skeletal muscle hypertrophy for each formoterol and 5-HOB (tested at 0.01 mg/kg, Fig. 4C), and the increase in evoked force between formoterol and 5-HOB was not statistically significant (P = 0.8086 by t test). The doses of β2-AR agonists showed comparable increase in plasma exposure across the three doses (Supplemental Table 1). Therefore, the relationship between plasma concentration and skeletal muscle effects were similar for both formoterol and 5-HOB. Dose-response effects of formoterol (A) and 5-HOB (B) on the weight of hind limb muscle and heart in Wistar rats. Effects of formoterol and 5-HOB on evoked force of hind limb muscle (C). Compounds were administered with subcutaneously implanted Alzet minipump for 4 weeks. Values are means ± S.E.M. or mean (n = 5 to 6), *P < 0.05; **P < 0.01 vs. vehicle control (Dunnett’s test following one-way ANOVA). To gain further insights into the effect of formoterol and 5-HOB on skeletal muscle mass and ejection fraction as a measure of cardiac function, longitudinal monitoring with MRI was conducted. Once daily subcutaneous treatment of 4 weeks followed by washout for 5 weeks allowed an assessment of duration of action and reversibility. The effect of 5-HOB on skeletal muscle mass was equivalent to the effect with formoterol at the same dose level (0.03 mg/kg QD), and this hypertrophy effect was maintained for 5 weeks after cessation of treatment, compared with the vehicle-treated groups (Fig. 5A). In the formoterol- and 5-HOB-treated groups, the increases in skeletal muscle mass compared with the vehicle control were statistically significant at 2, 4, 6, and 9 weeks (P < 0.05; Supplemental Table 2). There was no statistical difference on the increases in skeletal muscle mass between formoterol and 5-HOB (P > 0.05; Supplemental Table 2). In contrast to the effect on muscle volume, there was a clear difference in ejection fraction between formoterol and 5-HOB. During the 4-week treatment period, formoterol significantly reduced ejection fraction compared with the vehicle control (P < 0.05 at 2 and 4 weeks), whereas 5-HOB did not (P > 0.05 at all time points) (Fig. 5B; Supplemental Table 2). The change in ejection fraction between formoterol and 5-HOB was statistically significant at 2 weeks (P < 0.0001) and became not significantly different after 4 weeks (P > 0.05 at 4, 6 and 9 weeks) (Supplemental Table 2). During the washout period, the effect of formoterol on ejection fraction was found to be reversible, and returned close to baseline. Time-course changes of hind limb muscle mass (A) and ejection fraction (B) in Wistar rats. Changes in hind limb muscle and ejection fraction were evaluated by MRI during treatment with formoterol and 5-HOB once daily subcutaneously at 0.03 mg/kg for 4 weeks and during washout for 5 weeks. Values are means ± S.E.M. (n = 6–8). **P < 0.01 vs. vehicle control (Holm-Sidak test following two-way repeated measurement ANOVA). Cardiovascular Effects in Wistar Rats and Rhesus Monkeys. To evaluate if 5-HOB would show attenuated acute cardiovascular effects in vivo after a single subcutaneous treatment, as indicated by the cellular and isolated organ assays, we monitored heart rate in Wistar rats and rhesus monkeys. In the rat, formoterol induced a maximum heart rate increase of approximately 150 bpm at the three highest doses tested (0.01–0.1 mg/kg), and a nearly maximal effect at the lowest dose (0.003 mg/kg, Cmax = 2.2 nM) within 5 minutes of dosing, as shown in Fig. 6A. In contrast, compared with the vehicle control, the effect of 5-HOB on heart rate was apparent only at the highest tested dose (0.3 mg/kg, Cmax = 18 nM) with an increased heart rate of +58 bpm (a 14% increase from the baseline) and showed almost no effect at the lower doses (Fig. 6B). Thus, formoterol is more potent than 5-HOB in inducing a positive chronotropic effect, as reflected by the relative shift in the dose-response relationships (Fig. 6C). The effect of formoterol was statistically significant at all doses, and the effect of 5-HOB was statistically significant only at 0.3 mg/kg (Supplemental Table 3). Unlike the changes in heart rate, formoterol dose dependently decreased mean arterial pressure by a maximum of approximately 30 mm Hg, whereas the effect of 5-HOB on mean arterial pressure was again apparent only at 0.3 mg/kg (Fig. 6D). The effect of formoterol was statistically significant above 0.01 mg/kg and the effect of 5-HOB was statistically significant only at 0.3 mg/kg (Supplemental Table 3). Nevertheless, formoterol was still 1.5–2 orders of magnitude more potent than 5-HOB in eliciting a vasodepressor response. Heart rate changes in Wistar rats after single subcutaneous treatment with formoterol (A) or 5-HOB (B). Dose response (0–10 minute average) plots of formoterol and 5-HOB for heart rate (C) and mean arterial pressure (D). Values are expressed as means (A and B) or means ± S.E.M. (C and D) (n = 3 to 4) of changes from predose baseline values. *P < 0.05; **P < 0.01 vs. vehicle control (Dunnett’s test following one-way ANOVA). In rhesus monkeys, a single subcutaneous dose of formoterol increased heart rate by +60 bpm at 5 minutes postdosing (+32% from predose baseline) at 0.01 mg/kg with plasma concentration of 7.7 nM (Fig. 7A). In contrast, a single subcutaneous dose of 5-HOB showed a heart rate change of +17 bpm at 30 minutes postdosing (+9.2% from predose baseline), which is in the range of the variability observed in the control groups after being returned to their pens, at 0.03 mg/kg with plasma concentration of 4.4 nM (Fig. 7A). There was no obvious heart rate change observed with 5-HOB dosed at 0.01 mg/kg. 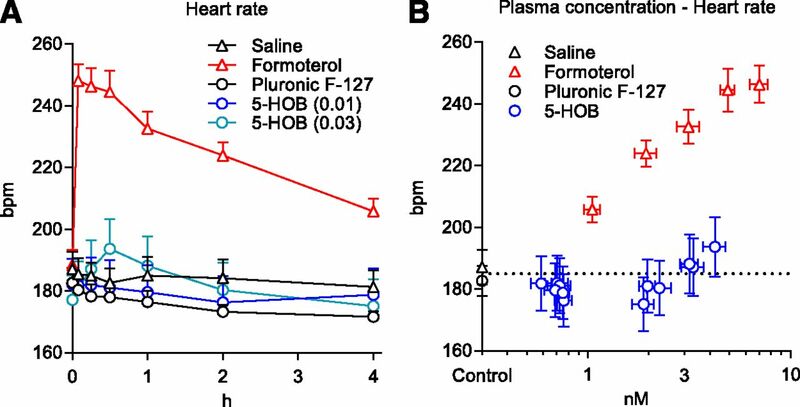 The effect on heart rate with 5-HOB was clearly lower than that of formoterol when plasma concentrations to heart rate response relationships are compared, as illustrated in Fig. 7B. Blood glucose and serum potassium levels were also evaluated as well-described β2-AR-mediated pharmacodynamic markers (Supplemental Fig. 3): Formoterol dosed at 0.01 mg/kg induced hyperglycemia between +40% and +43% compared with predose baseline, whereas 5-HOB dosed at 0.03 mg/kg increased blood glucose by around 13%, which is in the range of variation observed in the control groups after they were returned to their pens, compared with the predose baseline levels. There was no obvious change in blood glucose levels observed with 5-HOB dosed at 0.01 mg/kg. The hyperglycemic effect of 5-HOB was clearly lower than that of formoterol. Moreover, the degree of hypokalemic effects showed a similar trend as observed with the blood glucose changes, and 5-HOB clearly showed a lesser effect on serum potassium levels (Supplemental Fig. 3). Overall, 5-HOB has a favorable profile in terms of cardiac and metabolic effects compared with formoterol, i.e., on heart rate, blood glucose, and serum potassium changes. Heart rate changes in rhesus monkeys after single subcutaneous treatment with formoterol or 5-HOB (A). Heart rate was measured with a Surgivet V3304 device under restrained condition. Relationships of plasma concentration (nanomolar) to heart rate response (bpm) (B). Values are expressed as means ± S.E.M. (n = 6) of absolute values. In the present study, we have investigated the preclinical pharmacological profile of 5-HOB, a novel β2-AR agonist with a potent anabolic effect on skeletal muscle but with markedly attenuated cardiovascular effects, which was investigated for the treatment of skeletal muscle wasting conditions in which cardiovascular effects associated with this class of drugs would be undesirable. To benchmark the profile, 5-HOB was compared with formoterol as a class representative and well characterized β2-AR agonist. Before this study was performed, it had not been previously demonstrated that one could achieve relative tissue selectivity with a β2-AR agonist. In a radioligand binding assay, 5-HOB demonstrated high affinity for the human β2-AR. 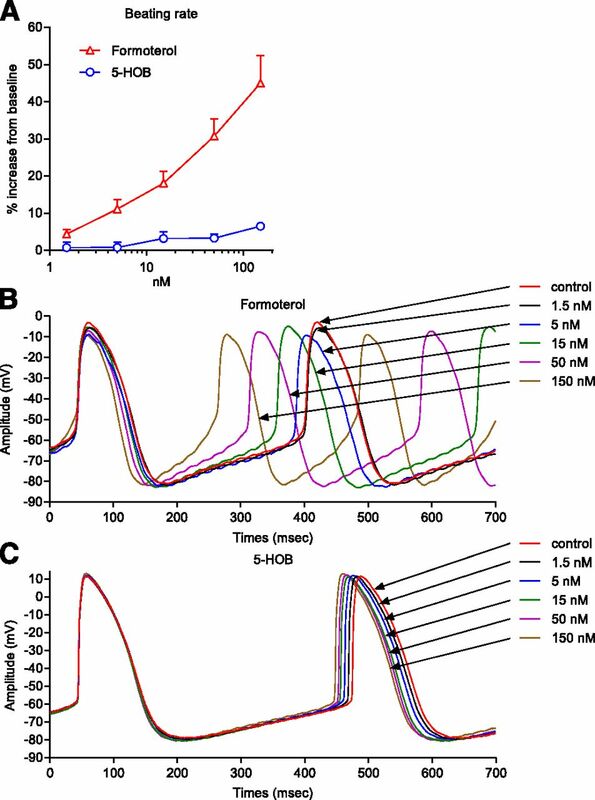 The β2-AR binding affinity translated into observed in vitro efficacy, exemplified by the rise in intracellular cAMP in which 5-HOB had high potency in the nanomolar range on the β2-AR and displayed selectivity over β1-AR and β3-AR. The receptor selectivity profile of 5-HOB against the β-AR subtypes is comparable to that of formoterol but with lower intrinsic efficacy on the β1-AR, which is advantageous for 5-HOB in terms of cardiac safety as the β1-AR is the main subtype expressed in the heart (Zheng et al., 2005) and implicated in pathologic remodeling effects (Engelhardt et al., 1999; Morisco et al., 2001). While the β2-AR also contributes to cardiovascular effects (Molenaar et al 2000), studies in β-AR-subtype knockout mice imply that the β1-AR plays a predominant role in catecholamine-mediated regulation of heart rate and myocardial contractility (Chruscinski et al., 1999; Rohrer et al., 1999). This suggests that β2-AR-selective agonists could offer an advantage for a reduced cardiovascular side-effect profile. Therefore, lower efficacy of 5-HOB on the β1-AR compared with formoterol might contribute to the compound’s favorable cardiac profile. The relevance of β3/β2 selectivity is currently less clear, although it has been shown that activation of β3-AR in the ventricle may cause negative inotropic effects in the heart (Gauthier et al., 2000; Angelone et al., 2008). The main roles described for the β3-AR are in lipolysis and bladder relaxation, i.e., tissues in which this receptor subtype is predominant (Philipson, 2002; Yamaguchi, 2002). Our studies have also investigated β2-AR agonist–mediated stimulation in systems with an endogenous distribution of receptors: in primary cells and in cell membranes prepared from rat tissues. 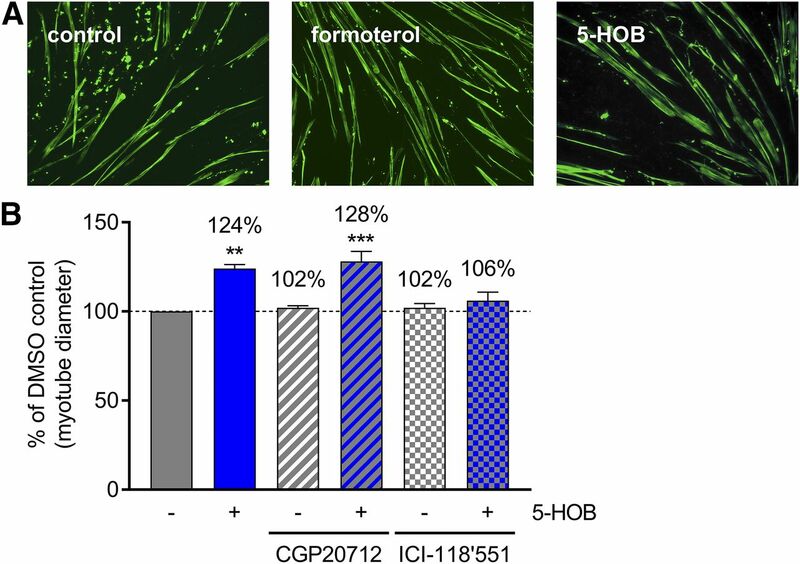 In a functional cAMP assay using primary skeletal muscle cells, 5-HOB was shown to be a highly efficacious agonist, but in cardiomyocytes 5-HOB behaved as a partial agonist with a reduced intrinsic efficacy versus formoterol. Consistent with the result obtained in skeletal muscle myotubes and cardiomyocytes, both 5-HOB and formoterol appeared to be equally efficacious agonists in skeletal muscles membranes, whereas 5-HOB was a less efficacious in heart membranes compared with formoterol. Like differences between the two agonists were also observed in the assays using isolated organs for evaluating the effect on the cardiovascular system. Thus, 5-HOB showed only a weak effect on pacemaker activity and on aortic ring relaxation, and no effect on atrial contractility. 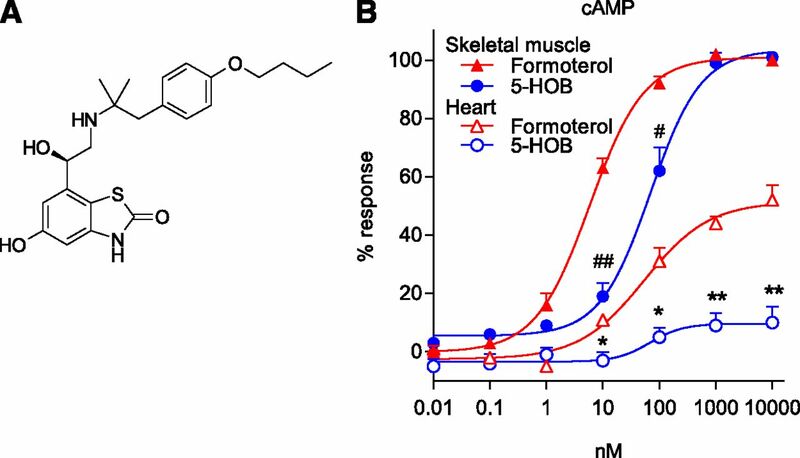 In contrast, formoterol exerted potent effects on chronotropy, inotropy, and vascular relaxation, as would be expected from a conventional β2-AR agonist. In our studies both β2-AR agonists, 5-HOB and formoterol, displayed comparable anabolic action on skeletal muscle in vitro and in vivo. In addition, we demonstrated that the 5-HOB-induced skeletal muscle hypertrophy is β2-AR mediated. In vitro, 5-HOB promoted significant hypertrophy in human skeletal muscle myotubes and this effect was blocked by the β2-AR antagonist ICI-118,551, but not by the β1-AR selective antagonist CGP20712. This is in line with what has previously been shown in vivo by others: the β2-AR agonist (clenbuterol) mediated skeletal muscle hypertrophy can be blocked by selective β2-AR antagonists, or by genetic deletion of the β2-AR (Choo et al., 1992; Hinkle et al., 2002). Also in our in vitro assay formoterol- and clenbuterol-induced hypertrophy were blocked by ICI-118,551 (Supplemental Fig. 2). In line with our in vitro hypertrophy data, in rat studies both 5-HOB and formoterol were capable of inducing comparable strong skeletal muscle hypertrophy as well as increasing muscle function measured by evoked force at an equivalent plasma concentration. However, 5-HOB caused lower increase in heart weight compared with skeletal muscle weight while formoterol produced nearly equivalent increases in both heart and skeletal muscle weight. This selective action of 5-HOB on skeletal muscle could be further demonstrated by the lack of an effect on cardiac function, as measured by ejection fraction, in comparison with formoterol which significantly decreased ejection fraction during the treatment period. It seems clear that the increased heart rate was associated with the decreased cardiac function in the formoterol treatment group. When acute cardiovascular effects were evaluated, formoterol at a dose of 0.003 mg/kg, with a Cmax of 2.2 nM, was sufficient to elicit almost the maximum heart rate increase of approximately 150 bpm (approx. 35%–40% increase) in the rat. In contrast, although the highest doses of 5-HOB achieved approximately 10-fold higher Cmax value (18 nM at 0.3 mg/kg), heart rate was increased by only 58 bpm. The effect of 5-HOB on mean arterial pressure was also less compared with formoterol. Overall, 5-HOB was about 1.5–2 orders of magnitude less potent than formoterol in eliciting cardiovascular responses. These differences in heart rate responses between formoterol and 5-HOB were also well reproduced in a similar plasma concentration range in the rhesus monkey. These in vivo findings clearly reflect the results obtained with isolated organs for inducing cardiovascular effects, implying that 5-HOB is indeed a partial agonist, not only in the cardiovascular system, but also in other organs such as the liver based upon the effect on glucose levels (Supplemental Fig. 3). 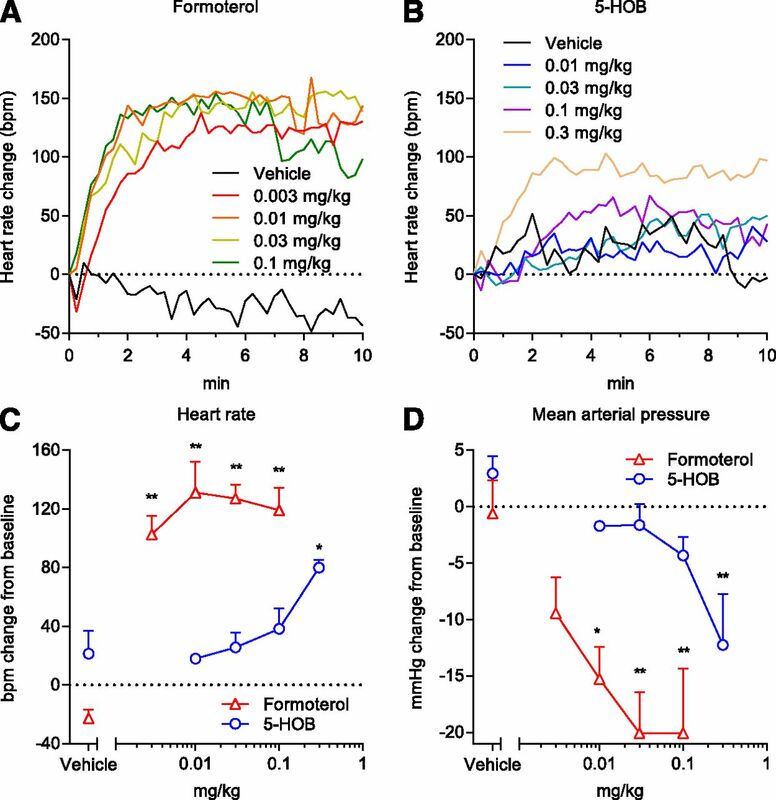 The lack of effect on cardiac function as well as the attenuated acute cardiovascular responses with 5-HOB provide a clear advantage over conventional β2-AR agonists, such as formoterol, which apparently do not exhibit such tissue selectivity. What is particularly encouraging were the effects of 5-HOB on rhesus monkeys. In these animals, formoterol had a significant effect on heart rate even at the lowest dose, inducing a 60 bpm increase; in contrast, 5-HOB did not cause a statistically significant effect, even at therapeutic levels. As discussed above, the attenuated effect of 5-HOB on heart rate could be partially explained by its receptor selectivity for the β2-over the β1-AR, detected in in vitro functional studies. However, other factors may contribute to the greater effect of 5-HOB on skeletal muscles compared with effects on the heart. The differential responses between tissues may also be related to differences in absolute β2-AR numbers, as well as differences in β2-AR/G protein/AC ratios between the different tissue types. A drug that is a partial agonist in one tissue could also be a full agonist in a different tissue wherein either receptor density or receptor-to-response coupling efficiency is relatively high. Supporting this notion, it has been shown for the partial agonist salmeterol that the maximal agonist-mediated stimulation of cAMP production can be increased through the elevation of total levels of β2-AR (McDonnell et al., 1998). Additionally, other studies have demonstrated that enhanced expression of AC enables greater maximal cAMP generation following receptor activation (MacEwan et al., 1996). Our data clearly demonstrate that 5-HOB shows the characteristics of a partial agonist: in cAMP functional assays, it displayed partial efficacy in both cardiomyocytes and membranes isolated from the heart. On the other hand, we detected higher β2-AR expression at the mRNA level in skeletal muscle compared with heart tissue in the rat, and in cells isolated from these organs (Supplemental Fig. 4). Thus, in skeletal muscle tissue, a lower intrinsic efficacy agonist such as 5-HOB may be able to provoke a maximal functional response because the receptor density is relatively high and, or, the receptor reserve is relatively large. In contrast, in the heart with a lower level of receptor expression a lower intrinsic activity compound, such as 5-HOB, would have minimal efficacy. Interestingly, such tissue selectivity has been described previously for adenosine A1 receptor agonists. Low intrinsic efficacy adenosine A1 receptor agonists can reduce lipolysis at concentrations that do not cause effects on heart rate due to a greater receptor reserve in adipose tissue compared with cardiac tissue (Wu et al., 2001; Fatholahi et al., 2006). 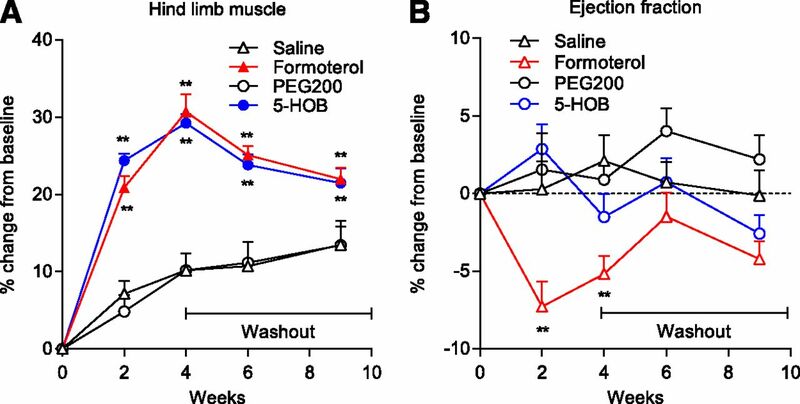 In summary, the preclinical data reported in this study show that 5-HOB is a potent, selective β2-AR agonist that is effective in promoting skeletal muscle growth. Furthermore, 5-HOB displays tissue selectivity and reduced cardiovascular effects, compared with the well-described representative β2-AR agonist formoterol in preclinical studies. Hence, these data suggest that 5-HOB may provide a new valuable treatment option for muscle atrophy conditions. Clinical studies will determine whether 5-HOB has the potential for reduced cardiac side effects at therapeutic doses in humans compared with other conventional β2-AR agonists, such as formoterol. We thank Ralf Endres, Daniel Lehmann for bioanalytics support, and Michael S. Hansen and Yun Jiang for imaging support, and Wei Chen, Fumin Fu, Michael Beil, Jing Liu, and Marie-Claude Del Grosso for cardiovascular profiling support, and Antonia Rosenstiel for cAMP assay support. Participated in research design: Koziczak-Holbro, Rigel, Dumotier, Sykes, Tsao, Adachi, Kiffe, Azria, Charlton, Richardson, Lach-Trifilieff, Glass, Hatakeyama. Conducted experiments: Koziczak-Holbro, Rigel, Dumotier, Sykes, Tsao, Nguyen, Bösch, Jourdain, Flotte, Adachi, Kiffe, Azria, Hatakeyama. Contributed new reagents or analytic tools: Fairhurst, Ullrich. Performed data analysis: Koziczak-Holbro, Rigel, Dumotier, Sykes, Tsao, Nguyen, Bösch, Jourdain, Flotte, Adachi, Kiffe, Azria, Hatakeyama. Wrote or contributed to the writing of the manuscript: Koziczak-Holbro, Rigel, Dumotier, Sykes, Tsao, Adachi, Kiffe, Fairhurst, Charlton, Lach-Trifilieff, Glass, Ullrich, Hatakeyama. ↵1 Current affiliation: School of Life Sciences, Queen’s Medical Centre, University of Nottingham, Nottingham, UK. ↵2 Current affiliation: MilliporeSigma, Boston, Massachusetts. ↵3 Current affiliation: RWA Pharma Ltd., Bath, UK. ↵4 Current affiliation: Rigel BioPharma Consulting LLC, Berkeley Heights, New Jersey. Financial support for this work was provided by Novartis Institutes for BioMedical Research, Novartis Pharma AG. Coauthor M.A. died before the manuscript was written. (2008) β3-adrenoceptors modulate left ventricular relaxation in the rat heart via the NO-cGMP-PKG pathway. Acta Physiol (Oxf) 193:229–239. (2006) In vitro and in vivo pharmacological characterization of 5-[(R)-2-(5,6-diethyl-indan-2-ylamino)-1-hydroxy-ethyl]-8-hydroxy-1H-quinolin-2-one (indacaterol), a novel inhaled β(2) adrenoceptor agonist with a 24-h duration of action. J Pharmacol Exp Ther 317:762–770. (2007) β-Adrenoceptor signaling in regenerating skeletal muscle after β-agonist administration. Am J Physiol Endocrinol Metab 293:E932–E940. (1991) β 1- and β 2-adrenoceptors in the human heart: properties, function, and alterations in chronic heart failure. Pharmacol Rev 43:203–242. (2007) Anabolic effects of a non-myotoxic dose of the β2-adrenergic receptor agonist clenbuterol on rat plantaris muscle. Muscle Nerve 35:217–223. (2004) Anticachectic effects of formoterol: a drug for potential treatment of muscle wasting. Cancer Res 64:6725–6731. (1973) Relationship between the inhibition constant (K1) and the concentration of inhibitor which causes 50 per cent inhibition (I50) of an enzymatic reaction. Biochem Pharmacol 22:3099–3108. (1992) Anabolic effects of clenbuterol on skeletal muscle are mediated by β 2-adrenoceptor activation. Am J Physiol 263:E50–E56. (1999) Targeted disruption of the β2 adrenergic receptor gene. J Biol Chem 274:16694–16700. (2006) Counteracting muscle wasting in HIV-infected individuals. HIV Med 7:299–310. (1999) Progressive hypertrophy and heart failure in β1-adrenergic receptor transgenic mice. Proc Natl Acad Sci USA 96:7059–7064. (2006) A novel partial agonist of the A(1)-adenosine receptor and evidence of receptor homogeneity in adipocytes. J Pharmacol Exp Ther 317:676–684. (2004) Pilot trial of albuterol in Duchenne and Becker muscular dystrophy. Neurology 62:1006–1008. (2000) The negative inotropic action of catecholamines: role of β3-adrenoceptors. Can J Physiol Pharmacol 78:681–690. (2014) Phase I/II trial of formoterol fumarate combined with megestrol acetate in cachectic patients with advanced malignancy. Support Care Cancer 22:1269–1275. (1971) Action of β-adrenolytics on the isolated Guinea-pig atria. Arch Int Pharmacodyn Ther 191:133–141. (2002) Skeletal muscle hypertrophy and anti-atrophy effects of clenbuterol are mediated by the β2-adrenergic receptor. Muscle Nerve 25:729–734. (1984) Evaluation of a new bronchodilator, formoterol, using biochemical parameters. Rinsho To Kenkyu 61:251–260. (1980) A quantitative analysis of β-adrenergic receptor interactions: resolution of high and low affinity states of the receptor by computer modeling of ligand binding data. Mol Pharmacol 17:14–23. (1991) Characterization of β 1- and β 2-adrenoceptors in rat skeletal muscles. Biochem Pharmacol 42:1783–1789. (2001) Randomized, double-blind, placebo-controlled trial of albuterol in facioscapulohumeral dystrophy. Neurology 57:1434–1440. (2014) An antibody blocking activin type II receptors induces strong skeletal muscle hypertrophy and protects from atrophy. Mol Cell Biol 34:606–618. (1989) Role of β 1-receptors and vagal tone in cardiac inotropic and chronotropic responses to a β 2-agonist in humans. Circulation 79:107–115. (1989) Formoterol fumarate, a new β 2-adrenoceptor agonist. Acute studies of selectivity and duration of effect after inhaled and oral administration. Allergy 44:264–271. (2008) Role of β-adrenoceptor signaling in skeletal muscle: implications for muscle wasting and disease. Physiol Rev 88:729–767. (2007) Therapeutic approaches for muscle wasting disorders. Pharmacol Ther 113:461–487. (1996) Agonist regulation of adenylate cyclase activity in neuroblastoma x glioma hybrid NG108-15 cells transfected to co-express adenylate cyclase type II and the β 2-adrenoceptor. Evidence that adenylate cyclase is the limiting component for receptor-mediated stimulation of adenylate cyclase activity. Biochem J 318:1033–1039. (1993) Clenbuterol, a β-adrenoceptor agonist, increases relative muscle strength in orthopaedic patients. Clin Sci (Lond) 84:651–654. (1992) Salbutamol, a β 2-adrenoceptor agonist, increases skeletal muscle strength in young men. Clin Sci (Lond) 83:615–621. (1998) Influence of receptor number on the stimulation by salmeterol of gene transcription in CHO-K1 cells transfected with the human β2-adrenoceptor. Br J Pharmacol 125:717–726. (2000) Both β(2)- and β(1)-adrenergic receptors mediate hastened relaxation and phosphorylation of phospholamban and troponin I in ventricular myocardium of Fallot infants, consistent with selective coupling of β(2)-adrenergic receptors to G(s)-protein. Circulation 102:1814–1821. (2001) β-adrenergic cardiac hypertrophy is mediated primarily by the β(1)-subtype in the rat heart. J Mol Cell Cardiol 33:561–573. (1984) The kinetics of competitive radioligand binding predicted by the law of mass action. Mol Pharmacol 25:1–9. (2002) β-Agonists and metabolism. J Allergy Clin Immunol 110(6 Suppl):S313–S317. (1996) Targeted disruption of the mouse beta1-adrenergic receptor gene: developmental and cardiovascular effects. Proc Natl Acad Sci USA 93:7375–7380. (1999) Cardiovascular and metabolic alterations in mice lacking both β1- and β2-adrenergic receptors. J Biol Chem 274:16701–16708. (2010) Novel role for ß-adrenergic signalling in skeletal muscle growth, development and regeneration. Clin Exp Pharmacol Physiol 37:397–401. (2008) Intramuscular β2-agonist administration enhances early regeneration and functional repair in rat skeletal muscle after myotoxic injury. J Appl Physiol (1985) 105:165–172. (2007) Attenuation of age-related muscle wasting and weakness in rats after formoterol treatment: therapeutic implications for sarcopenia. J Gerontol A Biol Sci Med Sci 62:813–823. (2006) Systemic administration of β2-adrenoceptor agonists, formoterol and salmeterol, elicit skeletal muscle hypertrophy in rats at micromolar doses. Br J Pharmacol 147:587–595. (1995) Effects of chronic infusion of (-)-isoprenaline on rat cardiac muscarinic (M2)-cholinoceptors and β 1- and β 2-adrenoceptors. J Auton Pharmacol 15:239–255. (2007) Society of toxicologic pathology position paper: organ weight recommendations for toxicology studies. Toxicol Pathol 35:751–755. (2008) Albuterol increases lean body mass in ambulatory boys with Duchenne or Becker muscular dystrophy. Neurology 70:137–143. (1990) The use of adrenal substance in the treatment of asthma. 1900. J Asthma 27:401–406, discussion 399. (2012) Slow receptor dissociation is not a key factor in the duration of action of inhaled long-acting β2-adrenoceptor agonists. Br J Pharmacol 165:2672–2683. (2010) Measuring receptor target coverage: a radioligand competition binding protocol for assessing the association and dissociation rates of unlabeled compounds. Curr Protoc Pharmacol Chapter 9:Unit 9.14. (2007) Loss of skeletal muscle mass in aging: examining the relationship of starvation, sarcopenia and cachexia. Clin Nutr 26:389–399. (2009) Myostatin reduces Akt/TORC1/p70S6K signaling, inhibiting myoblast differentiation and myotube size. Am J Physiol Cell Physiol 296:C1258–C1270. (2013) Hierarchical IDEAL: fast, robust, and multiresolution separation of multiple chemical species from multiple echo times. Magn Reson Med 70:155–159. (2009) The β3-adrenoceptor as a therapeutic target: current perspectives. Pharmacol Res 59:221–234. (2001) A partial agonist of the A(1)-adenosine receptor selectively slows AV conduction in Guinea pig hearts. Am J Physiol Heart Circ Physiol 280:H334–H343. (2002) β3-adrenoceptors in human detrusor muscle. Urology 59(5 Suppl 1): 25–29. (2005) Emerging concepts and therapeutic implications of β-adrenergic receptor subtype signaling. Pharmacol Ther 108:257–268.